Myra Warren Isenhart, PhD, is president of Organizational Communication, Inc., a firm she founded in 1990 that offers training and consulting services. Typical seminars focus on conflict management, negotiations, team building, personal leadership development, public speaking, and interpersonal and small group communication. Typical interventions involve the development of professional teams in a workplace. A partial client list includes the Colorado Outward Bound School, Computer Technology Associates, Coors, Hewlett-Packard, Honeywell, Kaiser Permanente, The National Council on State Legislatures, and the Western Executive Seminar Center. Myra has an undergraduate degree from Wellesley College and an MA and PhD from the University of Denver (DU). She has received mediation training from various institutions, including Harvard Law School Mediation Program and the Center for Dispute Resolution. She is an active member of the Society for Professionals in Dispute Resolution and a Guidelines Member of the Colorado Association of Mediators and Mediating Organizations. Myra also has an extensive background in higher education. She has taught undergraduates at the University of Denver and the University of Colorado at Denver. For 10 years, she was a faculty member at St. Thomas Theological Seminary, teaching graduate courses in communication skills for leadership. In addition, she served as internal consultant to the rector, assisting in establishing a national board of trustees, merging with another seminary, and integrating the student body. Currently, she teachers in the Communications Division of University College, DU. She is the author of many articles on communication and organizational development. She has served on the boards of a number of nonprofits, including the Colorado Outward Bound School, the Institute of International Education, the Episcopal Diocese of Colorado, and The Conflict Center, where she is immediate past president of that board. She is married and the mother of three grown children and a perpetually adolescent Black Lab named Max. Michael Spangle, PhD, is Director of Applied Communication, managing the graduate programs in communication and ADR at University College, University of Denver. In addition, he teaches courses in conflict management, negotiation, facilitation, and team communication. He holds an MDiv from Luther Theological Seminary, an MS from Kearney State College, and a PhD from the University of Denver. He has more than 25 years of professional experience as a consultant, counselor, and teacher. Some of the groups with whom he has worked are U.S. West; U.S. Department of Health and Human Services; Colorado Convention and Tourism Bureau; the National Real Estate Association; and many schools, hospitals, and church groups. He has published many articles and coauthored a book titled Interpersonal Communication in Organizational Settings. Marjorie Corman Aaron, Esq., is a former executive director of the Program on Negotiation at Harvard Law School He formerly practiced civil litigation with a Boston firm and acted as Assistant District Attorney in Plymouth County, Massachusetts. In June 1998, she moved to Cincinnati, Ohio, where she practices negotiation, mediation, and dispute resolution. Jo Anderson is Director of the Illinois Education Association-National Education Association's Center for Educational Innovation. Edward A. Dauer, Esq., is Professor of Law and Dean Emeritus at the University of Denver. William R. Drake is the Executive Director of the Western Justice Institute. Michael Jenkins, Esq., is Community Development Coordinator for the City of San Diego. Joan B. Kelly, PhD, is Executive Director of the Northern California Mediation Center in Corte Madera, California. Daniel H. Kruger, PhD, is Professor of Industrial Relations at the School of Labor and Industrial Relations at Michigan State University. Speed B. Leas, MDiv, is a consultant to religious organizations and an educator of church leaders Trained at the Yale School of Divinity, he is ordained a minister in the United Church of Christ. Jack Lemley is the CEO of American Ecology Company and resides in Boise, Idaho. Leonard J. Marcus, PhD, is founding Director of the Program for Health Care Negotiation and Conflict Resolution at the Harvard School of Public Health. John Marks founded Search for Common Ground in 1982 and serves as its president. Christina Sickles Merchant, PhD is an independent dispute resolution consultant. Christopher W. Moore, PhD, is a partner in CRD Associates, an international collaborative decision-making and conflict management firm located in Boulder, Colorado. Barbara Ashley Phillips, Esq., is a professional mediator. She introduced mediation into business disputes in the early 1980s as founder of American Intermediation Service in San Francisco. Nancy H. Rogers, Esq., is the Joseph S. Platt-Porter Wright Morris and Arthur Professor of Law at the Ohio State University College of Law. Rosemary Romero is President and Executive Director of Western Network, a nonprofit firm based in Santa Fe, New Mexico. Mary Rowe, PhD, is Ombudsperson at MIT and Adjunct Professor of Negotiation and Conflict Management at the MIT School of Management. Frank E.A. Sander, Esq., is Bussey Professor and Associate Dean at Harvard Law School. Cynthia Savage, Esq., Director of the Office of Dispute Resolution for the Colorado Judicial Branch, is a lawyer, mediator, mediation trainer. John R. Schumaker, PhD, is the Natural Resource Alternative Dispute Resolution Program Leader for the Bureau of Land Management (BLM), U.S. Department of the Interior. Marshall Snider, Esq., is an arbitrator and an administrative law judge with the State of Colorado. Lawrence Susskind, PhD, Ford Professor of Urban and Environmental Planning, has been on the faculty in the Department of Urban Studies and Planning at MIT for 30 years. 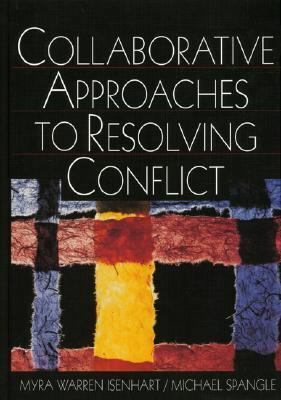 Mark Udall was elected in November 1998 to serve the 2nd Congressional District of Colorado in the U.S. House of Representatives.Isenhart, Myra Warren is the author of 'Collaborative Approaches to Resolving Conflict' with ISBN 9780761919292 and ISBN 0761919295. Loading marketplace prices 146 copies from $8.32 How does the rental process work?